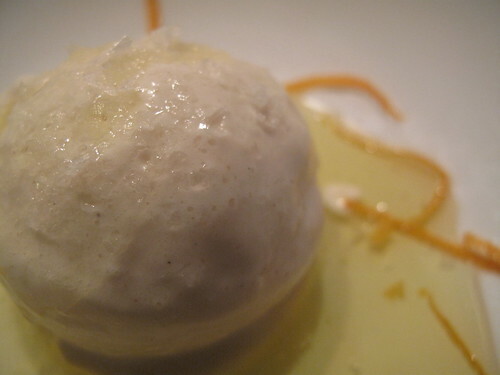 Dessert #1 is one of those recipes with high shock value – I think! It isn’t a combination that many people are used to and thanks to Jamie, I discovered it. It was 2 years ago that I first started cooking out of Jamie’s Italy. 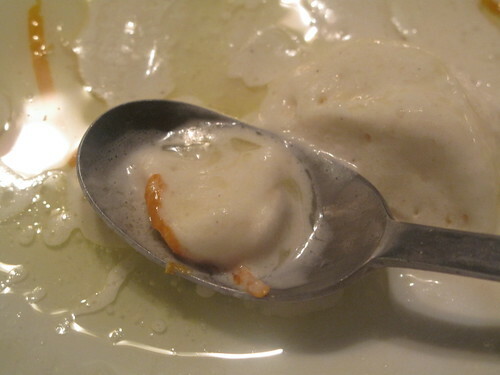 It was then I discovered gelato con olio e sale – ice cream with olive oil and sea salt! Just think salted chocolate caramel shortbread. Now before you write this off…please try it. We’re talking about gorgeous, stunning combinations. You must try it, if only for the novelty value. 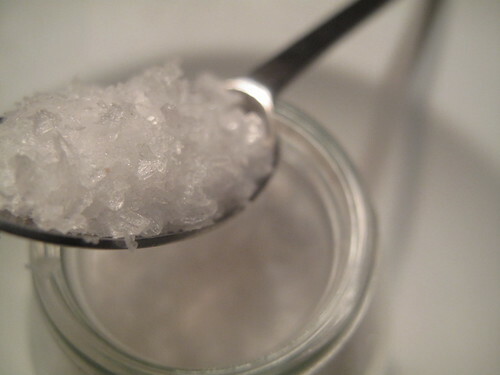 Of course you know what we ate the rest of that winter…till we got sick of it. I haven’t had it in ages but as another Christmas rolls by….my antennae is on high alert. 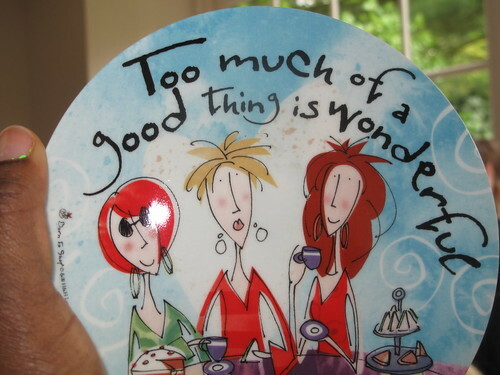 I especially love it with a few strips of orange zest..and I’ve been known to have chocolate shavings on it too. Try it….and tell me what you think. And if this fails, then try tea cloth chickens or turkeys. 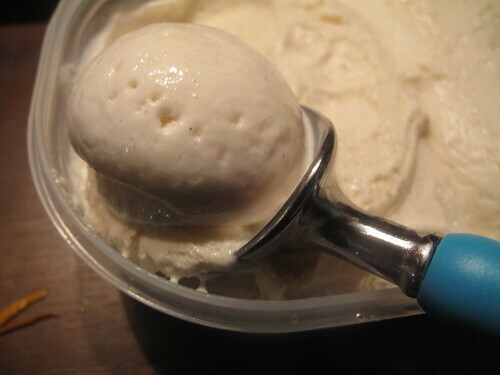 Put a few scoops of ice cream into bowls. 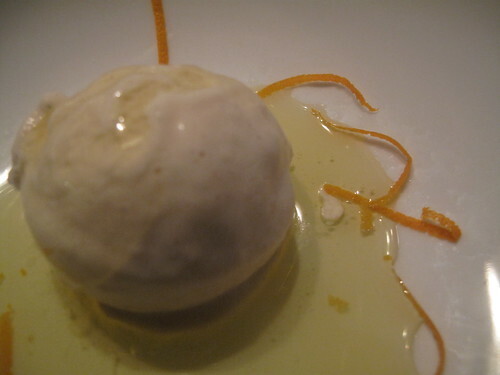 Garnish with orange zest and drizzle some oil over the ice cream ball. 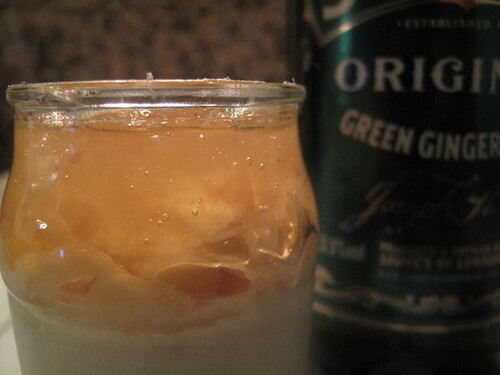 Dessert #2 is a prime example of the fact that too much of some things are good for you…if only to ginger creativity. 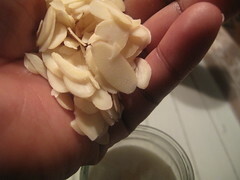 Once upon a time, I asked my friend, L to get me flaked almonds from Sligro. She returned with a 1kg bag! Once I had gotten over the shock, I started thinking of ways to use the almonds. 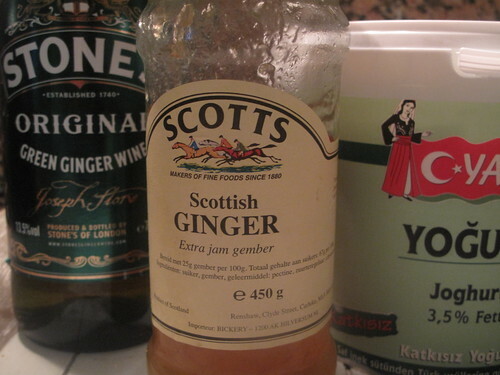 Weeks before, I had worked my way through 2 jars of rhubarb and ginger superjam (special delivery from the UK) with yoghurt! 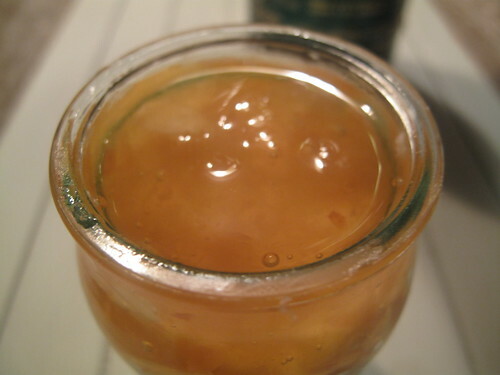 When I ran out of the jam, I discovered plain ginger jam and relief came. Of course, not wanting to keep this great discovery to myself, I served a bowl up to the husband…who is big on textures. He wasn’t quite as enthralled with plain yoghurt and jam….he wanted some spice. So out came the almonds…and amaretti cookies and the rest is history (without the amaretti!). And then to make matters better, I discovered Turkish yoghurt, which is similar to Greek yoghurt in the fact that they’re both strained, so why Turkish? 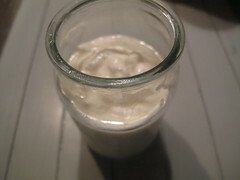 Smooth, creamy, mild taste, healthy (high in protein…just like Greek yoghurt), lovely, fresh…..I just love the stuff. This is my ultimate comfort food, the one recipe I find solace and rest in….whether its in a mug after a long hard day at work, or breakfast on a bright and cheerful monday morning. Easy to jazz up…add some ginger wine and cookies and an almost instant dessert for guests. Ready in 2! 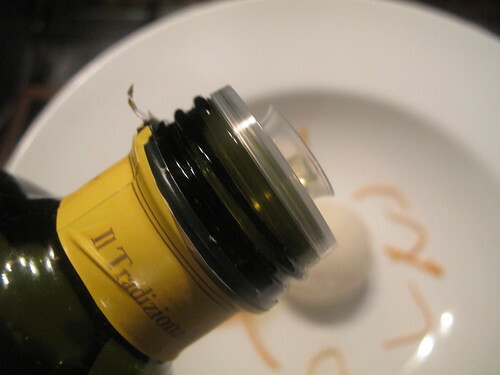 Put yoghurt in individual wine glasses, tumblers, jars, little bowl…or any receptacles. 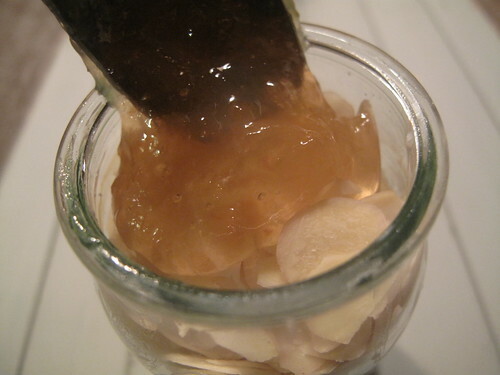 Sprinkle some almonds on top or layer with ginger jam. 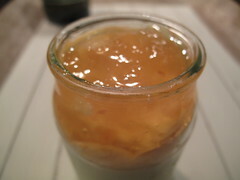 Top with ginger jam or sprinkle some almonds. Finish off with optional ingredients…if you wish. Now, I find that when I want to make this for breakfast, I do it overnight, a bit like the swiss bircher. 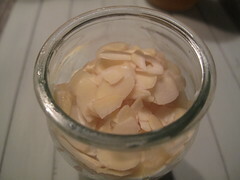 Then, I put the yoghurt in a bowl, spread the ginger jam and then top with almonds. The next morning, I have a bowl of creamy deliciousness with almonds that are soft with a bit of bite. So simple…yet so amazing. Happy Thanksgiving. May the joy, peace and blessings of harvest and fruitfulness be with you all. Amen.